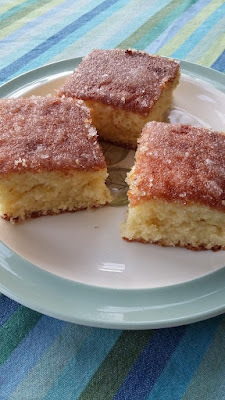 I intended to write a lengthy post all about the results of cutting our food bills during February, but got side-tracked by cooking (and eating) lemon drizzle cake. Earlier this afternoon, my husband hustled the children off for a wood gathering trip, disguised as a country walk. With the recent chilly weather we’ve been running short of kindling for the wood burner, and the Railway Walk in Hadleigh is a great place to go looking. It meant I could wade through assorted financial and school admin, but I also cooked a quick cake. I reckon if you come back wet and muddy from a long walk, there’s nothing like tucking into a hunk of cake still warm from the oven. Lemon drizzle cake is one of my favourites, because it is so easy to cook, and doesn’t require any fancy icing. Luckily the cake came out light and fluffy, and I just about had time to take the photo above before the whole lot disappeared. So if anyone else is looking for a cheap and cheerful crowd-pleasing cake, I recommend this one. It is not remotely gluten free, or sugar free, or diet-friendly, or fashionable – it just tastes great. 4oz / 112g Stork or softened butter, plus a bit extra to grease the tin. This is quite a low budget cake because you can make it with granulated sugar without mishap, and it only uses two eggs, topped up with some milk. You can also use bottled lemon juice in the topping. Part of the reason I made this cake today was because we had half a lemon knocking around in the fridge, plus the other half that I’d juiced for a different recipe. I grated the zest off both lemon halves, juiced the one that still had any juice, and topped up the lemon juice with bottled stuff. 1) Pre-heat the oven to 160 degrees C or gas mark 3. 2) I use a half size roasting tin for this recipe, about 17cm by 23cm at the base, but a round cake tin would work fine. To make sure the cake will come out without sticking, put the tin on some greaseproof paper, draw round the base, and cut out the resulting shape. Then grease the bottom and sides of the tin with a bit of Stork, pop the greaseproof paper into the bottom of the tin, and grease that too. 3) Mix all the cake ingredients together. Yup, the whole lot – Stork, sugar, flour, baking powder, eggs, milk and lemon zest. It’s particularly easy if you’ve got a food processor, and can chuck the whole lot in, turn it on, and stand well back. 4) Scrape out the resulting cake batter into the greased tin. Make ineffectual attempts to spread it out evenly across the bottom of the tin. 5) Put in a pre-heated oven and leave to cook. My original handwritten scrawl dictated by my mother reckons it needs to cook for about 50 minutes, and maybe a bit less if you have a fan oven. Now I’m trying to coax cakes out of an elderly Aga, I put the tin on a grid shelf on the bottom of the roasting oven, with the cold shelf on runners above it, and it takes 20 minutes at whatever heat that is. 6) While the cake is cooking, measure the sugar for the topping into a glass, and mix in the lemon juice. It should end up quite a thick liquid, rather than really runny. 7) When the cake looks golden brown on top, bounces back a bit when touched with your finger, and the edges of the cake have shrunk away slightly from the sides of the tin, whip it out. Before it cools, stab the top of the cake at regular intervals with a cocktail stick or skewer (this allows the lemon drizzle topping to seep into the cake). Spoon over the lemon juice / sugar topping, encouraging it to run all over the top of the cake. 8) Leave the cake for about 10 minutes, so it can cool down a bit, and the topping becomes a bit crunchy. When you want to turn it out, slip a knife round between the side of the tin and the edge of the cake to increase the chance it will come out of the tin cleanly. Then turn out the cake onto a clean hand or a clean tea towel, strip the greaseproof paper off the bottom, and put it on a cooling rack to finish cooling. 9) Fight your family to eat large chunks while it’s still warm. Resolve to start your diet, or resume any sugar-free marlarkey, tomorrow. What are your favourite family friendly cakes? I’d love some inspiration! The recipe mightn't be quite the same, but the outcome looks exactly like my lemon drizzle cake! We all ADORE lemon drizzle, it's inexpensive and delicious and can be eaten cold or just nicely warm from the oven with custard as a dessert, too. Total yum! Oh wow I've never tried it with custard before, my husband would love that combination! Chocolate depression cake, very chocolaty, quick and easy, no eggs or dairy, if you use veg.oil, and not expensive if you use unbranded cocoa powder.